Once a year the normally congested Los Angeles streets are blocked off for runners and bikes for the Los Angeles Marathon. The annual LA Marathon runs 26.2 miles past some of LA's most famous landmarks and through diverse neighborhoods with festivities all along the course from Dodger Stadium to the Pacific Ocean. Block Parties with live performances are spaced along the route to entertain fans while they're waiting for runners to pass, but the biggest festivities are at the Finish Line Festival. Other events associated with the Marathon are the Health & Fitness Expo at Dodger Stadium and the Motivational Dinner the night before the race as well as the 5k run and walk, which will be held the day before the LA Marathon. The 2018 LA Marathon is scheduled to be run on the same Stadium to the Sea route as last year beginning at Dodger Stadium, running through Chinatown, Silverlake, Hollywood, West Hollywood, and Beverly Hills, and ending at the Santa Monica Pier. You can now get the LA Marathon Smartphone App, with full course details, points of interest, race info, results tracking and social options. Also be sure to check out the official LA Marathon website for more information including partnerships, registration fees and forms, and contact details. The LA Marathon starts at Dodger Stadium north of Downtown LA and runs through Chinatown, Olvera Street, Little Tokyo, Hollywood, West Hollywood and Beverly Hills, ending just before the Santa Monica Pier at California and Ocean Avenues. Water and sports drinks are provided every mile after mile two along the course, and spectators cheer runners on from Block Parties all along the route. Bailout vans are provided after mile seven for people who can't complete the course. Marathon Start Times: Wheelchairs, 6:30 a.m.; Hand Cycles, 6:42 a.m.; Elite Women, 6:45 a.m.; Elite Men and Full Field, 6:55 a.m. The LA Marathon Health & Fitness Expo is the largest marathon expo in the world with representatives from every possible running, cycling, health, and fitness related exhibitor that you can imagine. All participants in the LA Marathon must pick up their bibs and goodie bags at the Expo, and the LA Big 5k participants can pick up their bibs at the Expo Friday or on race morning at Dodger Stadium. The event also features seminars and speakers on everything from physical and mental preparation for marathoners to how to choose the right running shoes. When: Friday, March 16 from 10 a.m. to 7 p.m. and Saturday, March 17 from 9 a.m. to 5 p.m. Parking: Garages nearby range in price from $12 to $20, check for other rates on Best Parking. The LA Big 5K is a race where entrants will have a computer chip to calculate their time like they do in the Los Angeles Marathon, but this event is geared toward the whole family. The course is a 3-mile loop from Dodger Stadium through the Elysian Park neighborhood around the stadium, and the 5k will take place the day before the LA Marathon. This year, 5K participants can either pick up their bibs, timers, and T-shirts on Friday at the Expo at the LA Convention Center or Saturday morning starting at 6:30 a.m. at Dodger Stadium Lot G. Parking (lot opens at 6). The event also takes place on Saint Patrick's Day in 2018, so be sure to take advantage of the festivities while after you run or watch the race. 1/2K Kids Run Start Time: 9:30 a.m. Parking: Free parking at Dodger Stadium via the Downtown Gate and the Sunset Gate, which open at 6 a.m.
You must have a runner's bib to be on the course during the race, and while there is no time limit to the marathon, slower runners and walkers will have to deal with traffic after six and a half hours when the roads open up behind the main pack. Course support stations will continue to operate until 3 p.m. distributing water to runners. Clear Gear Check bags will be provided to transport clothes or other non-valuables to the finish line. Only provided bags will be accepted at Gear Check, located in Parking Lot K, which closes at 6:45 a.m. There is a secured finish area where runners can collect their finisher medals and retrieve their gear before exiting to the Family Reunion area and the Finish Line Festival on Santa Monica Boulevard between Ocean and 2nd Street. Arrange to meet family and friends under a specific letter of the alphabet to avoid confusion. Runners are entitled to a free Michelob Ultra at the Beer Garden from 10 a.m. - 2 p.m. and a free massage in the Massage Tent on Ocean, just south of Broadway. 10,000 pay parking spaces have been arranged for runners in Santa Monica, and complimentary shuttles will transport runners with bibs to Dodger Stadium. Reservations are required for the shuttles, and you must reserve parking spaces in advance. Specific information will be sent to registrants, and there will be limited participant parking available at Dodger Stadium, but no return shuttle. Runners can be dropped off at Dodger Stadium before the race.The Golden State Gate is the only gate that will be open for parking and drop off. Cars parked at Dodger Stadium can be retrieved until 8 p.m. via the Sunset or Golden State Gates, or on Monday after 7 a.m. via the Sunset Gate. Runners at Official LA Marathon Hotels in Downtown LA or Beverly Hills will receive wristbands for shuttles to Dodger Stadium and returning from Santa Monica. If you're planning on taking advantage of the hotel shuttle, make sure you choose a downtown hotel. The Downtown and Beverly Hills Hotel Shuttles depart from in front of Santa Monica City Hall. 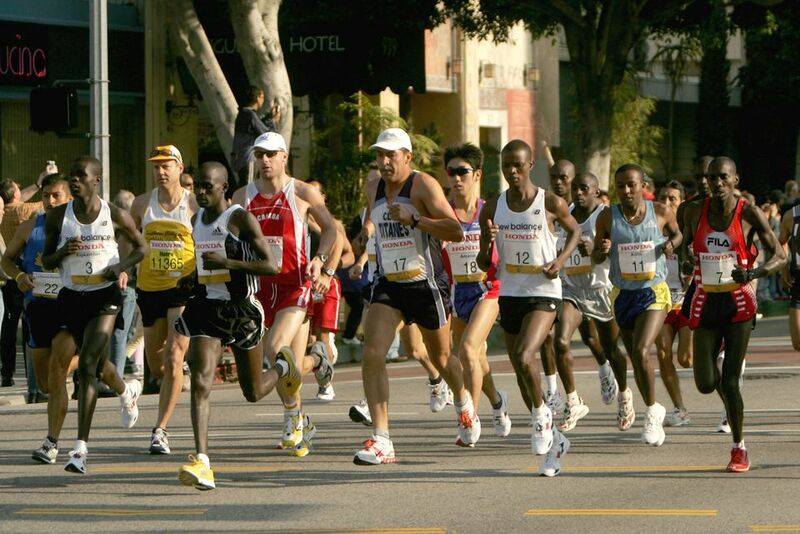 You can also stay in Santa Monica near the finish line and reserve a spot on the free shuttle to Dodger Stadium. There is also a morning shuttle from Union Station for people who want to take public transportation, but no return shuttle from Santa Monica. However, the Metro will provide a free shuttle to the Expo Line Metro Station in Culver City. There are City Block Parties set up at locations where spectators can watch the Marathon runners pass by. Food and entertainment, as well as the all-important portable toilets, will be available at these locations. There aren't any Metro Stations near the start or end of the race, but spectators can take the Gold Line to Chinatown or Union Station to watch the race through Downtown LA, or the Red Line to Hollywood and Vine or Hollywood and Highland to watch the race through Hollywood. Spectators can ride for the Metro's normal low rate of 1.75 each way or $7 for a Metro Day Pass (More on Riding the LA Metro). There are public parking lots near the finish, but they'll be packed, so if you're on a bus route or within biking distance, you might want to use alternate transportation to the Family Reunion Finish Line Festival on Santa Monica Boulevard. Spectators and family members do not have access to the finish line. If you have hopes of watching your loved ones cross the finish line, you will have to bring binoculars to watch from north of Washington or watch the televised version. Family Reunion stations will be set up at the Finish Line Festival so runners can reconnect with family and friends. Lettered meeting spots help people to find each other based on the runner's name. Be sure to discuss ahead of time which letter you're talking about to make sure everyone is thinking of the same name. In order to avoid delays in traffic on marathon day, be sure to check out specific street closures and times for individual streets on the LA Marathon route. Keep in mind that some freeway ramps will also be closed on marathon day, so you'll have to plan alternative routes, especially around downtown and northern Los Angeles. See the LA Marathon website for recommended detour routes to exit West Hollywood and Beverly Hills during the marathon, and the website Commuterama provides real-time street closures during the LA Marathon. If you plan to use public transit like the bus or train system, you'll also want to make sure you check the LADOT LA Marathon schedules before you head out for the day. Keep in mind that rideshares like Uber and Lyft will likely cost more on the day of the marathon. The 2018 LA Marathon will follow almost the same Stadium to the Sea route as in 2017. The LA Marathon route passes dozens of Los Angeles landmarks from Dodger Stadium through Chinatown, Little Tokyo, and historic Downtown, then through Hollywood, West Hollywood and Beverly Hills, ending at the beach in Santa Monica. There are points in Downtown Los Angeles and Hollywood where you can take the Metro to spectator areas along the LA Marathon Route, as shown on the map above. For more details on Metro stops, spectator areas and attractions along the LA Marathon Route, visit the official website.